Acton Town Hall in West London was originally built in 1904 to provide both swimming baths and personal baths. In 1926 the building known as the Kings Room’s was added and other facilities such as a restaurant were introduced. However since then, the population of Acton has grown considerably and the existing facilities were in need of upgrading, in order for the services provided to continue. The Town Hall is run by Ealing Council. When it was decided to renovate the facilities to bring them into the 21st century Ealing Council wanted to work with suppliers that would take this into account. The façade and the listed chimney were carefully considered in the renovation plans. The new facility needed to be refurbished to house a new 25m, 6 lane swimming pool, plus a training pool with moveable floor, as well as changing rooms and other associated spaces. In addition the building would house a library and council offices. 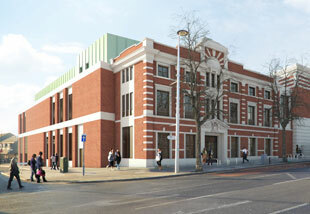 Ealing Council appointed AFLS&P as architects on the project and Willmott Dixon as contractors. Working alongside the architects and main contractor Spectile were chosen to supply the architectural tiling package. The package consisted of the pool tanks, pool surround, changing room floor tiles, dry side flooring and circulation flooring. As with all our projects Spectile were on hand to provide technical assistance and know-how around anti slip flooring and the HSE recommendations for both shod and bare foot traffic.